Ricardia is a rare range of fine quality art pottery produced by Richards, once Britain’s largest and most prestigious tile company. 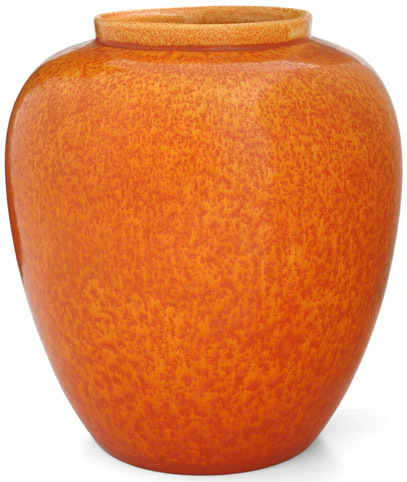 Probably produced from the late 1920s until the outbreak of war in 1939, the range primarily comprised decorative vases of different forms, but bowls, lidded boxes and smoking accessories were also made. This part of my website aims to detail as much as is known about this fascinating and highly desirable range of Art Deco art pottery. To find out more about shapes click here, to find out more about Ricardia’s stunning and complex glazes click here, and to read about marks used, click here. The name Ricardia is derived from the Richards company name. Although following the Art Pottery movement as laid down by William Morris, Ricardia was versatile enough to work perfectly with the Art Deco style. The precise dates when the range was introduced and discontinued are not yet known. Some sources suggest that the date of introduction was around 1918, but there is no evidence for this and it is more likely that it was introduced during the late 1920s, judging by the bright glaze colours. The only reference in Richards’ company literature is absolutely minimal. In 1933, following a visit from Prince George, a promotional booklet called ‘Richards Tiles In The Making’ was published that showed how tiles were produced. 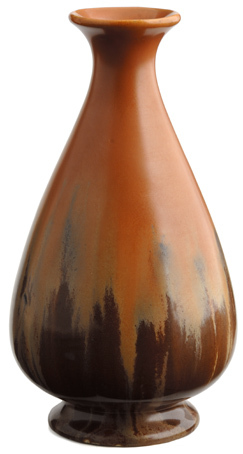 At the end, a list of products the company made includes ‘Ricardia Art Pottery’. No other reference in company archives has been found. 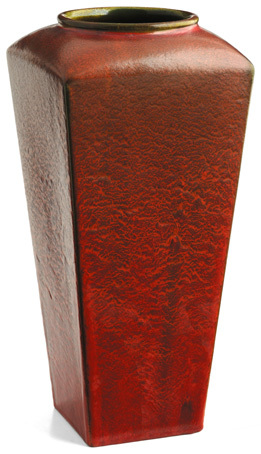 A number of dated presentation pieces are known which bear dates during the 1930s, including a cigarette box dated 1936. It is most likely that the range was not reintroduced after World War Two due to postwar restrictions on raw materials and coloured ceramics, and then the banning of lead in glazes in 1947. 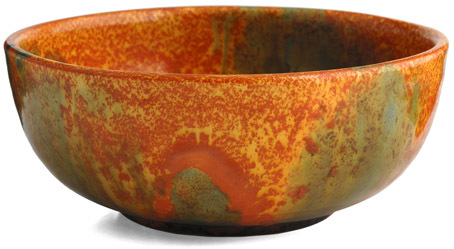 However, at least one glaze (Unknown6, shown here) seems simpler and more in the style of the postwar period, perhaps indicating that Ricardia was partially and briefly reintroduced after the war. Interestingly, pieces found with that glaze also have a printed mark on the base that could be seen to be in the postwar style. As the lack of company documents, other literature and the limited number of surviving examples of Ricardia indicate, it could not have been a core range for a company that had grown huge and rich on the sales of tiles, so was not needed to generate revenue. For more information about Richards Tiles and its history see below. This is not as stupid a question as it first seems. As stated above, the Ricardia range of art pottery was not a core line for Richards, who were first and foremost a tile manufacturer, and one of Britain’s largest at that. The only other three dimensional ceramics produced were part of a wide range of wall-mounted moulded bathroom and kitchen accessories such as soap dishes, toothbrush holders and towel rails. Known as ‘Recesso Ware’, a catalogue page is reproduced below. Factory employee Ken Green, who worked at Richards Tiles for over 60 years from 1941, recorded on Potteries.org that over 10,000 bathroom fitments and 250 fully tiled fireplaces were produced per week at the Pinnox factory in the late 1940s. This was in addition to the millions of coloured glazed tiles produced annually in Richards’ three factories. It is likely that Ricardia ware was produced at the Pinnox factory as it had the capabilities to produce ceramics other than flat tiles. After 1925, that factory also had four Dressler tunnel kilns in addition to the five bottle ovens. These tunnel kilns operated continuously, firing an endless stream of ceramics that were pulled slowly through the kilns on a train of trucks. Dressler kilns were also used at other companies including Devon based tile company Candy & Co. Ltd, who introduced a range of art pottery known as Wescontree Ware and then Candy Ware, in 1922. For them, art pottery was a way of ‘filling in the gaps’ in Dressler kilns, ensuring that they were producing as many saleable objects as possible at all times. There was also some keenness from the Candy & Co. management to produce a range of art pottery for sale. The comparison of Ricardia with Candy Ware (example right, c1937) is relevant and interesting. Both were produced by tile companies as a late foray into unique art pottery. During the 1920s, the vogue for (typically expensive) art pottery with unique, complex glazes or decoration led by Pilkington’s, Ruskin, Doulton, some studio potteries and other companies had started to subsided. The handmade, individual style set by William Morris and the Arts & Crafts movement – the original inspiration for such pottery – had gone out of fashion. Public tastes preferred more mass-produced ceramics with painted or printed stylish and novel Art Deco patterns such as those designed by Clarice Cliff or Susie Cooper, or made by Shelley, Poole Pottery, or Carltonware. One could say that drips were replaced with designs. Candy Ware survives in considerably larger quantities than Ricardia, and no catalogues, price or shape lists, or advertisements exist for Ricardia when they do for Candy Ware. Trade journals and periodicals of the period also contain no mention of Ricardia. All these facts indicate that Ricardia was perhaps not intended for sale. It is possible that it was produced for promotional reasons, both for display in shops and to act as good will gifts to retailers, agents and distributors who may in turn have presented pieces to house-building companies, key clients, and members of the public who placed large orders. As well as being supplied direct to builders, Richards Tiles were widely available across the country in shops and department stores, as were their fireplaces and Recesso fitments. It’s perfectly possible that Ricardia vases and bowls were given to stores to dress room sets or vignettes. 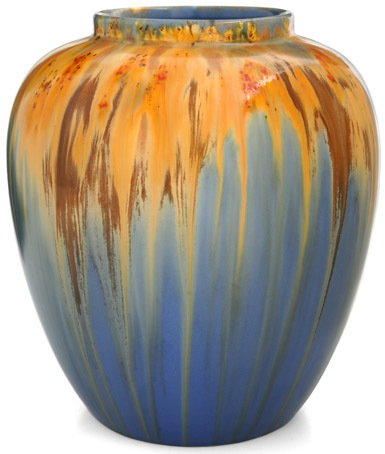 Their bright, eye-catching colours, forms that crossed modern with traditional, and (albeit previously) fashionable look would have caught buyers’ eyes, and the complex glazes would have spoken of Richards’ high quality. Some may have been sold, but it is likely that most were given away as favours, or even as a result of nationwide sales competitions. 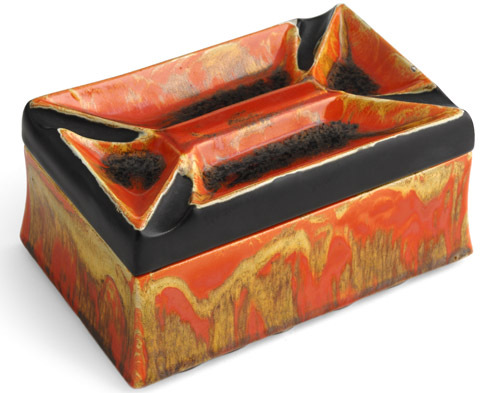 Some shapes, particularly smoking accessories such as ashtrays, are frequently found marked with a retailer’s name, which supports this point. Some marks also show that pieces were given benevolently as prizes to local organisations, or to commemorate a particular event. To see examples of these marks, please click here and move to the bottom of the page. Who designed and introduced Ricardia? 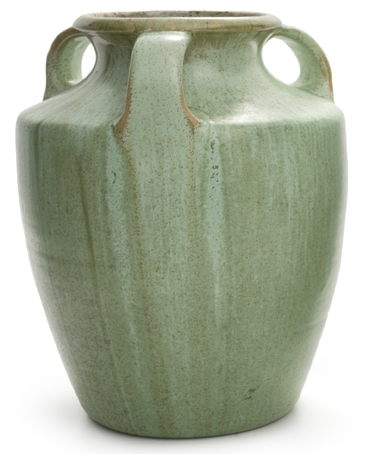 The lack of any primary evidence such as sales catalogues, advertisements, entries in trade or design journals, or any original documents in company archives means it is currently impossible to know who instigated the introduction of the range and designed the glazes and shapes. It must be presumed that it was not a famous designer hired from outside Richards as this fact would have been recorded elsewhere. Edward Reginald Geoffrey Corn (1899-1987), nephew of Edmund Richards Corn (1870-1945), the grandson of the founder. Known as ‘Mr Geoff’ around the company, he took an increasingly leading role in the company from 1916 onwards, and soon became a key Director. He would have been in his late 20s when Ricardia was probably introduced in the late 1920s. He instigated the ‘Ricardia Medal’, an 8in (20cm) diameter embossed and glazed plate produced in-house and given to employees for long service. Brabazon Ellis, listed as Production Director in 1941, and Mr Geoff’s cousin. Lawrence Bullin, listed as Technical Director in 1941, who was responsible for glaze research and development amongst other areas. As a side note, Bullin, Ellis and Corn introduced to the UK mastic for fixing tiles to walls, replacing the traditional cement, after a business trip to the US in 1949. Derek Watkin, who was listed as being specifically responsible for glazes in 1948, reporting to Lawrence Bullin. Although we cannot be sure that, apart from Mr Geoff, any of these figures were in positions of responsibility in the 1920s-30s, it seems likely that they were. Long-term factory employee Ken Green’s archive on Potteries.org does not state that any were new to their roles, and nor does he mention any predecessors. By 1965, Richards’ Head Designer was J.F. Adams, and Alex C. Hardy was also mentioned in connection with design. Nothing is known about these figures, but it can be assumed that they arrived at Richards after the war. In 1996, a good selection of Ricardia was included in the landmark exhibition ‘Art Pottery: The Legacy of William Morris’ that was launched at the City Museum & Art Gallery in Stoke-on-Trent before travelling around the UK for the next two years. It was well-received, well-publicised, and well-attended, but nobody came forward with any information about Ricardia, despite it having a sparse history in the catalogue. A few pieces of Ricardia were then included in the permanent display of inter-war ceramics at the Potteries Museum & Art Gallery in Stoke-on-Trent, where they remain on view today. Over 15 years have passed since the exhibition, so it is almost certain that anyone who had first hand experience with, or information about, Ricardia is no longer alive. 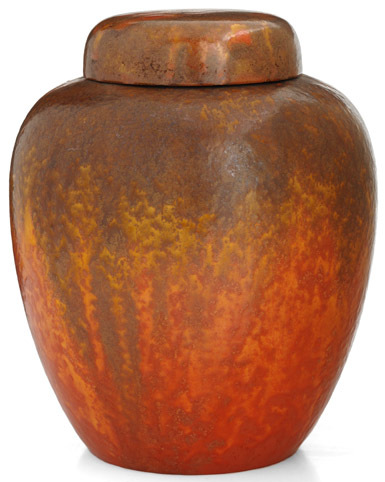 Unless a new company archive is uncovered, the exact origins and full background of this fine quality and highly decorative Art Deco art pottery are likely to remain mysteries. Founded in the heart of the Potteries in Burslem, Staffordshire in 1837 by Edward Corn, the original company produced domestic and utilitarian earthenware. Tiles were first produced in 1891 at a factory acquired by the company in Longport. Soon after, the company became highly successful, and tiles dominated production. 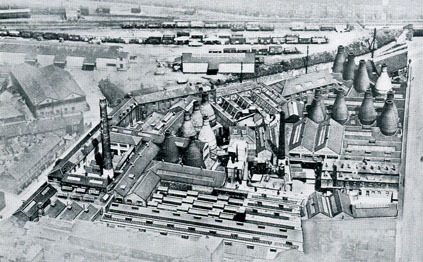 In 1903, the Pinnox factory in Tunstall (below) was acquired and extensively renovated to expand tile production. The success and wealth of the company continued to grow after World War One due to the boom in house building across the country that occurred between the wars. The development of suburbia exemplified by ‘Metroland‘ led to over 4 million new homes being built in and around major cities. Plain tiles simply decorated with coloured glazes were preferred over the encaustic and patterned tiles of the Victorian and Edwardian period. Richards Tiles, as the company was known from 1931 onwards, was perfectly placed to take advantage of this boom, and provided tens of millions of tiles and tens of thousands of tiled fireplaces for these new homes. 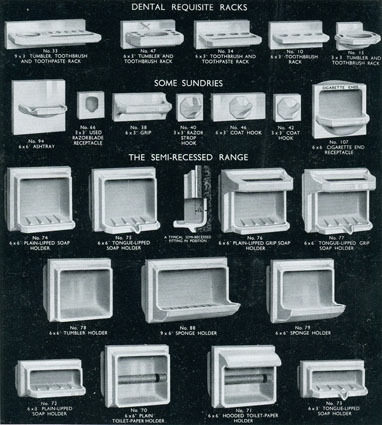 During this period, the company also introduced the ‘Recesso’ range of moulded bathroom fittings, including soap holders and towel rail brackets, which it produced at its Pinnox factory. In 1934, the company opened a vast purpose-built factory, at Brownhills, to expand tile production yet further. The 1950s & 60s saw a similar, if smaller, boom in house-building, and Richards Tiles expanded to meet this demand by acquiring Cauldon Tile Ltd in 1961 and T&R Boote in 1963. The company then merged with competitor Campbell Tile Co in 1963 to form the largest tile company in Britain. Five years later, in 1968, it merged with the equally successful company H&R Johnson to form H&R Johnson-Richards Tiles Ltd. The Johnson name was widely promoted and grew stronger than Richards during the late 1960s, and use of the Richards name was discontinued by 1972. H&R Johnson continues to produce tiles today. Millions of homes around Britain contained and will still contain tiles by Richards, who were one of Britain’s most successful and prolific tile producers for nearly a century. This is a work in progress. 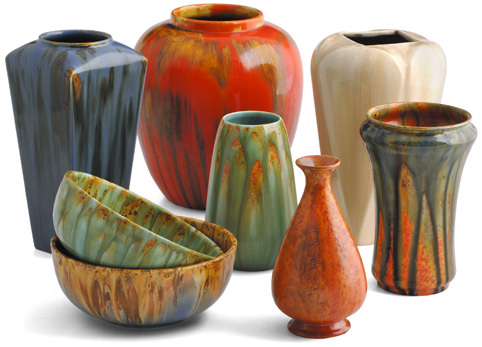 If you have any more information about Ricardia art pottery, please add to this knowledge base and contact me by clicking here. Mark Hill would like to thank the following for their help. Ian Turner, who built the Ricardia collection this information is based on, Miranda Goodby and Claire Blakey of the Potteries Museum & Art Gallery in Stoke-on-Trent, Chris Blanchett of the Blanchett Collection, Chris Latimer of the Stoke-on-Trent archives, and Angela Lee of the Gladstone Pottery Museum in Stoke-on-Trent. Art Pottery: The Legacy of William Morris, by Deborah Skinner and Jenine Evans, published by the City Museum & Art Gallery, Hanley, Stoke-on-Trent, 1996. VADS.ac.uk, Variety and Vitality in Ceramic Tiles, by Lucien Myers, 1965. Memories of Stoke-on-Trent: A Life in the Ceramic Tile Industry, Ken Green, 2001. Photographs of ceramics by Graham Rae and copyright Mark Hill Publishing Ltd. Images of Richards Pinnox factory and Recesso range with thanks to and courtesy of the Blanchett Collection.